Is Jon Jones Setting A Trend for Low UFC Ticket Prices? Despite the lack of buzz surrounding Jon Jones’ light-heavyweight title defense to Lyoto Machida this weekend, UFC 140: ‘Jones vs. Machida’ is, in fact, happening Saturday night. This fight isn’t generating the sort of buzz would one expect from such a dynamic, talented young champion, so what’s the problem? Is it an instance of a card simply being under-promoted? Or is this becoming a trend for Jones? 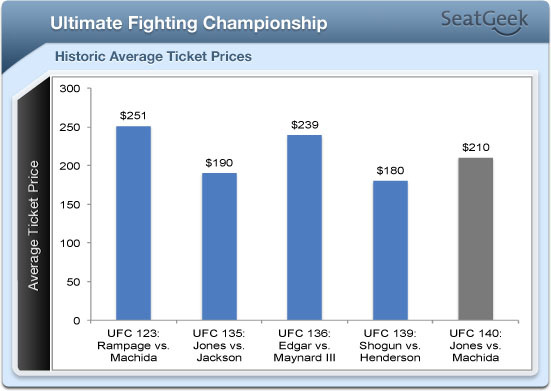 Tickets for UFC 140 are averaging at $210, about the going rate for a non-title headlined UFC fight card. Despite the average to low numbers, these prices are actually an improvement over his last fight at UFC 135 ($190) against Rampage Jackson. The highest average ticket prices involving the three actually came at UFC 123 when Jackson and Machida squared off for the right to face Jones for the title. Jackson went on to score a win over Machida via split decision. Now that Jackson has tried and failed, it’s Machida’s turn at the phenom. Tickets for UFC 140: Jones vs. Machida are still available on SeatGeek, with listings ranging from upper deck seats for $94 to floor seats selling for $1700.